It is a no brainer to guess the importance of hygiene in the hospitality industry. The reputation of a hotel mainly depends on the type and quality of services it provides. No matter how big the size of the rooms is, or how many varieties of food dishes are there on the menu, If the premises of the hotel lack cleanliness and hygiene, it is bound to lose valuable guests. Opportunely, you can convert your guest into a loyal customer by giving them the best service by providing them a clean, fresh and relaxing atmosphere to spend their vacation in. The Drainvac Central Vacuums have the best product that can make the tedious task of housekeeping easier and more convenient by its The Centralized Vacuum Cleaning System. A revolutionary cleaning system that is not only more powerful and efficient than the regular vacuum cleaners but also easier to use. 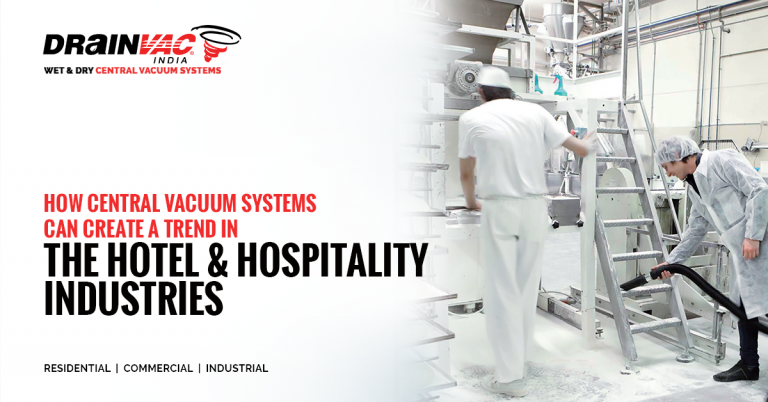 Here are a few reasons why hotel and hospitality industries are joining in on the trend of a central vacuum cleaner. Unlike the regular vacuum cleaners, you do not have to move the entire unit from place to place for cleaning. The main unit of the centralized vacuum cleaners can be kept in the storeroom while the extended vacuum pipes can be connected on different floors. The central vacuum cleaners give you the benefit of connecting vacuum pipes on every level and eliminates the need to carry the entire system from place to place making cleaning laid-back. Even the cleaning of difficult to reach and hidden places becomes way easier with the multiple brushes available for specialized cleaning. Large areas can be cleaned in lesser time as the motor is very powerful and can sustain for a longer duration without a compromise in efficiency. Central vacuum cleaners have a powerful motor which gives it a better suction ability, making it more efficient and time-saving. Since the motor does not heat up often even between large cleaning session makes it the most compatible equipment for deep cleaning of large spaces with the ability to not only clean surface dust and debris but also particulates that ruin carpets. As the main unit of the central vacuum cleaner is placed in the storeroom or the garbage dispensary away from the guest accommodation, using the central vacuum system cause minimum noise and makes it possible to carry out the cleaning and dusting routine without disturbing the guests. Housekeeping of large hotel spaces with multiple rooms is already a demanding task. The additional work of changing the filter bags from time to time makes it even more difficult. Fortunately, the capacity of the central vacuum system is more than enough to accommodate the dust particles and other garbage from multiple cleaning sessions. Keeping all these pointers in mind, to keep your business growing and for giving the best service to your guest, install the Drainvac Centralized Vacuum Cleaning System and work the smart and efficient way. Contact our experts today! And stay a step ahead of your competitors. « Best Tips In Maintaining The Serenity Of Any Commercial Place.